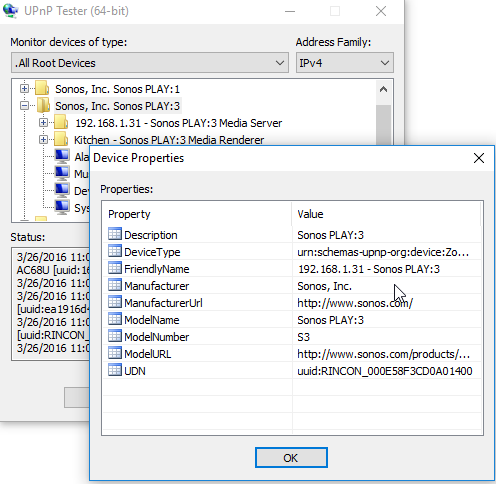 Note: The Sonos binding communicates with the Sonos devices through the UPnP (Universal Plug And Play) protocol. Users of this binding might wish to familiarise them with the protocol and slang. UPnP defines a subscription model whereby a UPnP client can subscribe to UPnP Events that are transmitted by a UPnP device. Sonos Players do emit quite a bit of Events and some are used to capture status variables (see below). Sonos Players support multi-room audio. Sonos achieves this by grouping Sonos Players into Zone Groups, and having a Player, the group coordinator, play music which is “streamed” to all the Players part of the Group. That way you can walk from room to room with the same music playing everywhere. Even more, since some Sonos Player models have a line-in socket, you can plug any device into such a Sonos Player, and have its content streamed to any other Player. For example, you can connect a CD player to a Sonos in the basement, and have that music streamed to the Sonos in the bedroom. Or, alternatively, you can connect the line-out of your openHAB system to the line-in of a Sonos, and use some text-to-speech scripts and rules to create a public address system. There is also a binding specifically for openHAB 2 here. That binding can discover your Sonos players and therefore does not need you to learn UDNs through alternate means. Sonos ZoneBridges are not supported. The binding is making use of a buggy UPNP library that result in memory leaks which may crash oenHAB occasionally. Sonos commands take time to execute. If applied too fast, the Sonos player will ignore the command and indicated this by an error message in the OSGi console. Especially the “group” and “radio” command need several seconds to execute. Also the timing is not predictable and the worst case has to be determined experimentally. In rules you may use Thread::sleep(x) //(x: ms) to delay the execution of Sonos command accordingly. The “Play/Pause” button will not create related events. 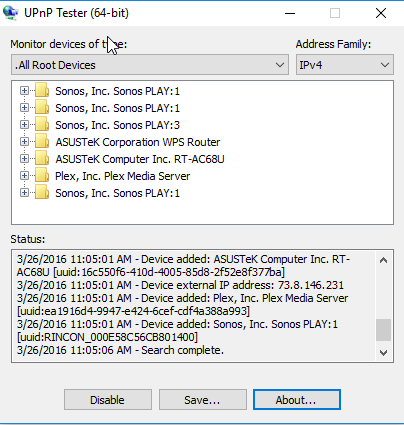 In order to control Sonos devices, you must know their UPnP Unique Device Names (UDNs). The easiest way to find your UPnP UDN is to use a UPnP scanner app. For Windows, UPnPTest works well. Once you’ve unzipped, run either the 32-bit or the 64-bit version that matches your architecture (if in doubt, try both). The binding can be configured in the file services/sonos.cfg. sonos="[<command>:<sonos id>:<sonos command>], [<command>:<sonos id>:<sonos command>], ..."
sonos="[<sonos id>:<sonos variable>], [<sonos id>:<sonos variable>], ..."
for either Number or String Items that rather store a status variable or other from the Sonos Player. <sonos id> corresponds with the UDN (UPnP Unique Device Name) or the <sonos id> you defined in the binding configuration. <sonos command> is the command to be sent to the Sonos Player when <command> is received. Some <sonos command>s take input variables, which are taken from the bound item. In case status variables are used then any value received from the Sonos Player for the defined <sonos variable> is used to update the item. The following files will get a single speaker to turn on and off via the web interface.